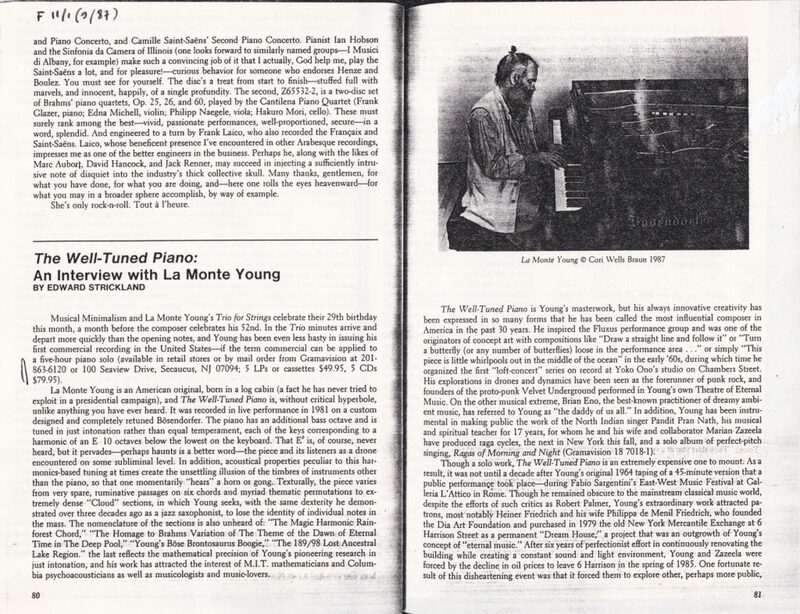 Friends of LaMonte Young, you are not going to like this review. But a true Democracy needs a dissenting voice (a typo made me first write “Demoncracy”. Love the concept), and newcomers to this composer and his magnum opus deserve a balanced view – given the price they would need to shell out in order to buy this 5-CD set, they want to make no mistake. My attention was drawn on this recording by a long interview of the composer published in the September 1987 issue of Fanfare . I quickly ordered it (I even kept the invoice! ), and it cost me 60 dollars of those days. Looking at the prices now demanded for it, it was a good investment (though, as long as I don’t sell, I ain’t rich). That said, I didn’t make it back then past disc 2. Then other CDs came in, begging for ear time, and I put this one aside, for an elusive “later”… which took these 20 years to materialize. So the “long journey” of the title isn’t only Young’s. But now I’m repainting my walls, so here’s a perfect time to go through. “In order to have a concept of the measurement of time it is necessary to have a concept of periodicity. If we assume that the measurement of time is dependent on periodicity, then we might also assume that in determining the relationship between two or more frequencies the human mechanism can best analyze information of a periodic nature which, in the case of information transmitted by the auditory neurological network, would include only those sets of intervallic relationships satisfying the condition that every pair of frequency components can be represented by some rational fraction, inasmuch as only combinations of these harmonically related frequencies can generate periodic composite sound waveforms“. b. that “each harmonically related interval creates its own unique feeling“, so that by multiplying intervals with more complex ratios than those commonly used, we can not only expand the feelings generated by these intervals, but “actually create, store, retrieve and, finally and most importantly, repeat the feeling, relative to the musician’s ability to tune the interval“. Listening to the music before reading the liner notes, I was under the impression that Young repeated a lot; now I know why. All those claims seem highly disputable – but who cares the theory? What counts is the result produced by it. So what about the music? 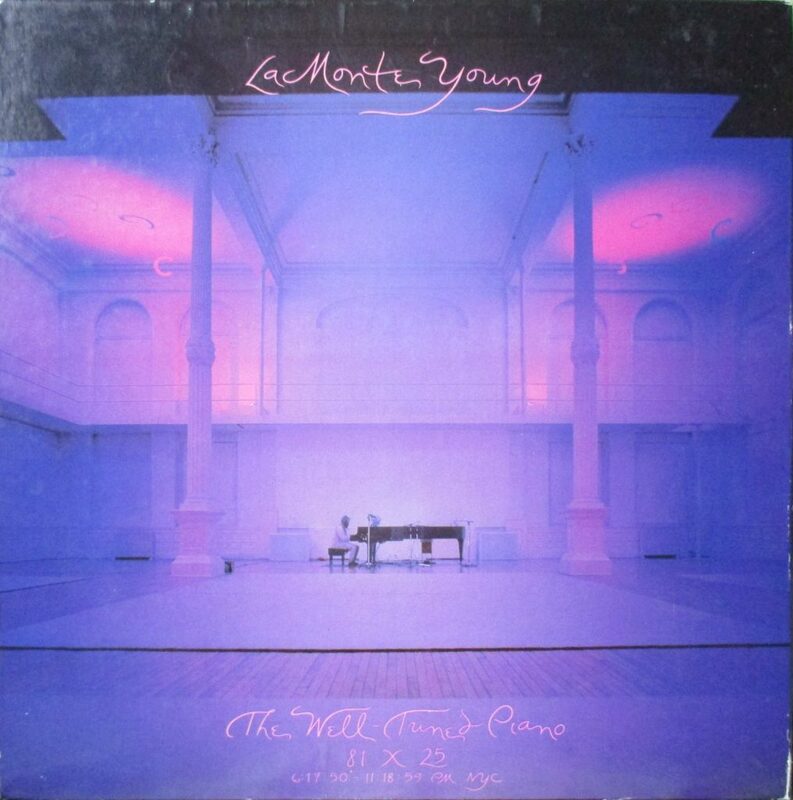 First thing: Young’s tuning may be acoustically and arithmetically “just”, but to ears attuned to Bach’s equal temperament, it sounds slightly out-of-tune, like the quarter-tone pianos so dear to 20th Century composers like Alois Haba, Ivan Wyshnegradsky or Ben Johnston – or like your grandma’s upright parlor piano. Not that I mind, either: it adds a bitter-sweet impression to the music, and at times it evokes Japanese Folk-music. Partly because of these overtones, in the upper register the piano has a brittle quality, making it sound almost like a cymbalum, especially in the more busy moments. And the music itself? Meditative, dreamy, wistful, and constantly ebbing and flowing to and from waves of agitation – Young calls them “Clouds”, but they are little more than accelerating the arpeggios really, not very sophisticated stuff. And the same process goes on over and over again. Young’s impros seem based on one or two very simple compositional processes which he tirelessly repeats in the course of the improvisation’s five hours. I don’t know what kind of feeling his intervals are supposed to unleash, but with me five hours of them produced a degree of – how can I phrase it nicely? – dissipation of my attention, and even impatience (at the predictability – “ah ah, I can hear the new wave coming”!). Young’s disciple Terry Riley had the good sense to keep HIS improvisations short (see The Harp of New Albion). This might be fine on a live occasion, pillows, magenta lights, communing with others in the event, snuggly dozing off and waking up again – but on CD? It is certainly atmospheric, but I wonder if enjoying five hours of the same atmosphere doesn’t require the ingestion of certain illegal substances, in order to help your mind fly and your feelings be unlocked by the just intervals. One thing remains, though: the instrument’s lower frequencies are impressive, thanks no doubt to Young’s extended Boesendorfer. This is music in the wake of the inventions of Henry Cowell: less a journey in “music” than a journey in pure, acoustic sound. Other than that: the object in itself makes this a collector’s item. The five CDs are enclosed in an LP-sized and shaped cardboard box, about an inch thick (not very practical for storage in your CD collection, but maybe that’s the point), with a lavish booklet opening with a New Age Eulogy by Terry Riley that verges on the embarrassing (“this is a Holy Work”, no less, “a realm of ecstasy flowing from the Divine through the visionary perception of the West’s foremost musical prophet”). 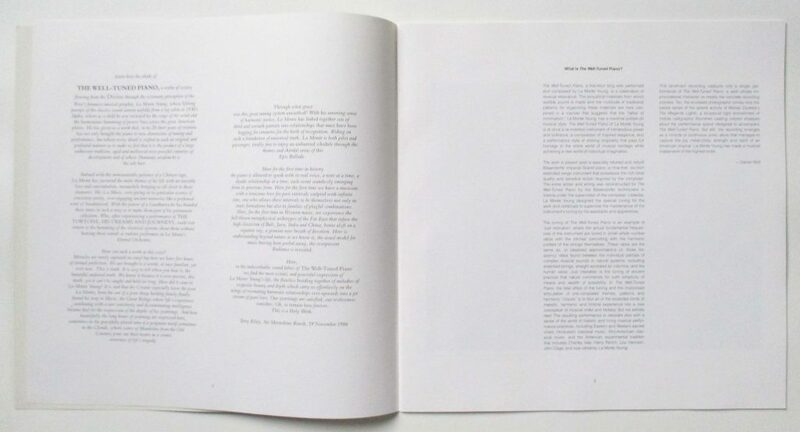 There’s a short presentation by Daniel Wolf, the long essay already mentioned by Young on his work, a blurb by Marian Zazeela, the visual artist (and Young’s wife incidentally) who makes the magenta lighting design without which Young will not play his composition, and a long bio of Young. There is also a detailed description, with timing from beginning, of the piece’s musical events (“Themes, Chordal Areas, and Durations”) – I’ve counted 397 of them in the course of the piece’s 5 hours, one minute and twenty-two seconds, which makes roughly one every 45 seconds. I didn’t hear that there were so many. This performance was recorded on 25 October 1981, the last in a long series of concerts during which Young, by his own assessment, perfected his tuning and playing. It can be considered definitive.